Southampton Independents: Updated: Stop the Violence! 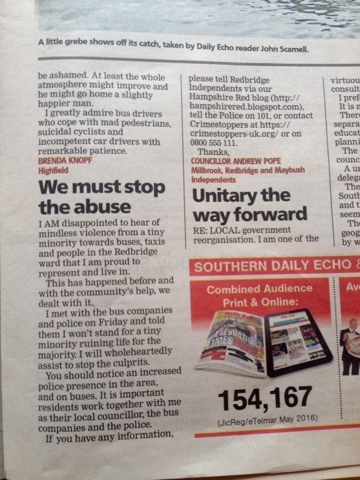 Above is the letter on the recent violence towards buses and taxis in Redbridge. It was printed in the Daily Echo on 27th September 2016. "I am disappointed to hear of mindless violence from a tiny minority towards buses, taxis and people in the Redbridge ward of Southampton that I am proud to represent and live in. This has happened before and with the community's help, we have dealt with it before. I met with the bus companies and Police on Friday. I told them that I won't stand for a tiny minority ruining life for the majority of residents in our wonderful area. I told them that I would wholeheartedly assist to stop the culprits. You should notice an increased Police presence in the area, and on buses. It is extremely important that residents work together with me as their local councillor, the bus companies and the Police. If you have any information, please tell Redbridge Independents via our Hampshire Red blog (http://hampshirered.blogspot.com), tell the Police on 101, or contact Crimestoppers at https://crimestoppers-uk.org/ or on 0800 555 111. Thanks,Councillor Andrew PopeMillbrook, Redbridge and Maybush Independents"
Hampshire Police have posted this on their website.